Killer Characters: While On My Way To Work This Morning . . . While On My Way To Work This Morning . . .
Another day, another dollar. After being in debt for the past seven months, sometimes it feels like a dollar is all I have left in my wallet after I pay my rent, buy gas for the car, and feed my cat, Mason. Okay, I exaggerate. I'm technically no longer in debt--I paid off my husband's funeral expenses in August, but I still haven't been able to put any real money in the bank, either. And every day when I drive to work I have to pass the money pit. That's what I call Artisans Alley. I had big plans to renovate the old Webster mansion on the edge of charming Victoria Square. It was to be called the English Ivy Inn. I would run the kitchen and handle the books, and my late husband Chad would play host, paint his still lifes, and all would be well with the world. Chad's been gone for seven months. Seven long, lonely months. As I passed the money pit this morning, I had to pull into the parking lot. Why is there a police car in front of the building? Why is the side entrance open before 8 am? I need to get out of my car and investigate. That'll make me late for work, and that'll make my boss go off on another of his rants. Yet somehow, I have a feeling I won't be making it into work today . . .
A Crafty Killing will debut on February 1st. It's available for pre-order from Amazon, Barnes & Noble, and any independent bookstore. For an excerpt, click here. To see the book trailer, click here. In addition to writing the Victoria Square Mysteries, Lorraine also writes the Booktown Mysteries as Lorna Barrett, and the Jeff Resnick Mysteries as L.L. Bartlett. I don't think the sight of police car outside the money pit is a good thing. Can't wait to read the book. Pre-ordered it this morning! Katie, so sorry for your loss. Now that you're on your own, be very careful. Ear alert, eyes open, know what I mean? 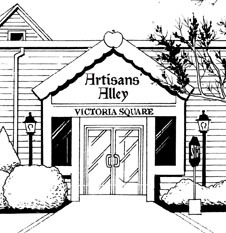 I can't wait to visit Artisans' Alley! I'm sorry for your loss, Katie, but I have to admit, I can't wait to visit Artisans' Alley. Katie - you are an amazing woman and it will take more than a police car to throw you off your stride. I am looking forward to your first adventure! excited for some new cozies to start the new year!! !